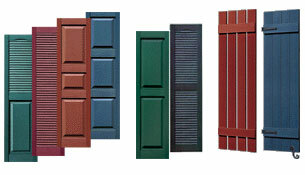 Vinyl Shutters – A great complement to a well done siding job. The most common of all the shutters on the market today is the louvered vinyl shutter. 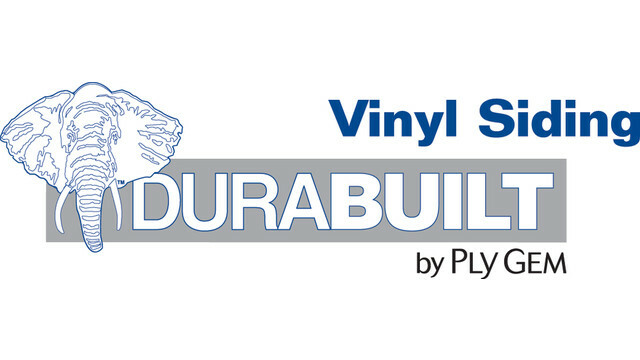 Available from nearly every manufacturer to match their vinyl siding lines and in many colors you will see these on many homes. Available in full length without a break or a common mid-point break as well. If you want to get really fancy look for a 1/3 and 2/3 design. The slats are angled and the only negative to these is the occasional need to spray out with a hose as dust bunnies can form as well as on occasion bees. In recent years thought we have seen solid backed panels as well. Something to watch out for is very thin shutters that are super cheap as well as fade very quickly. A good quality set of shutter will wholesale for around $100-$150 depending on size. We really like seeing these shutters used in proper design. 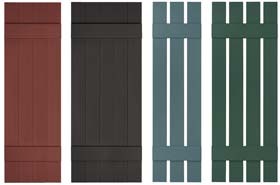 They are a step back to traditional site constructed shutters from scrap or nominal lumber and with new vinyl technology the color can stay for decades. If your home can handle these go for it. 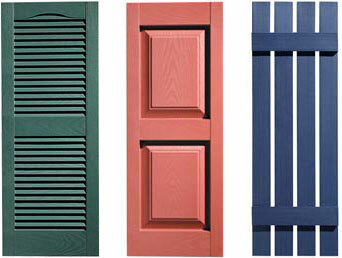 Simply a mix between two very popular shutters the louvered and raised panel varieties. Relatively uncommon to us they just look like someone could not make up their mind or something. Nonetheless they are different and different is good. If they appeal to your particular sense of style that’s awesome. A good slightly bolder choice of shutter than the traditional louvered variety. When placed on a home they look very strong and certainly draw a little more attention than run of the mill shutters. Available in quite a few different configurations as you can see so spice it up. One word of caution: less is more so if you don’t have very long windows stick with one or two panels please. 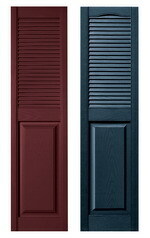 These are actually one of the easiest accessories to your new vinyl siding job to install that you will come across. They simply screw in a predilled whole with either a color coated screw or a vinyl cap to hid the screw whole which is what we recommend.